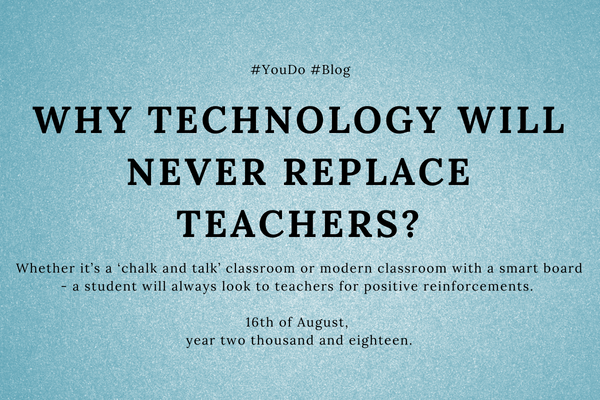 Home|Blog|Why technology will never replace teachers? In an online world where Google seems to have answers to all questions, can technology ever replace teachers? The answer is No, because learning is a two-way process, where the student receives and the teacher imparts knowledge. At the best technology can assist but replacing the teacher altogether is a far-fetched idea! From Gurukul to modern classrooms the environment of learning has changed a lot. Yet, it is hard to imagine a classroom without a teacher because teaching is not SYNONYMOUS to speaking aloud to a captive audience. Rather, it is imparting knowledge to students – telling them concepts of numbers and words which will last with them for the rest of their life. Learning overlaps with education and the teacher is the facilitator in it. Education opens multiple opportunities for a child which would not be possible without learning elementary concepts and lessons from the start. Whether it’s a ‘chalk and talk’ classroom or modern classroom with a smart board – a student will always look to teachers for positive reinforcements. A nod of approval from them or a ‘well done’ remark increases the confidence of the child several times. Empathy is a key element in teaching and technology falls short of it. A teacher has to constantly gauge if the student is getting disinterested about a concept that is being taught because they are bored or they are finding it difficult to understand. A teacher can apply the discretion whereas the technology can’t. That’s why experiments where technology was used to sidestep the teacher have not succeeded. Students rely on teachers for resolving their doubts and concerns. And when they are feeling the pressure of studies right before exams the teacher motivates them and keeps them on the track. Technology at best can be a part of a teacher’s expanding toolkit. It can help a teacher simplify difficult concepts, lessons or problems in a simpler way. As classrooms continue to change shape, a smart board can transport a student to the flora and fauna of a specific continent but it will always be the teacher who will unfold the magic of learning. And the teacher weaves this spell by combining his words with the right images and pictures. That explains why even in typical classrooms a map or diagram is hung on the blackboard to illustrate geography or biology lessons. It has been learned in the recent years that the conscious part of our brain provides an input but it’s the subconscious mind that takes decisions. That part of the brain – the subconscious mind thinks in pictures. When you try to think of the word boat, there will be an image of boat inside your mind. It’s highly unlikely that the syllables B-O-A-T will scream. The subconscious mind likes excitement which visuals provide. Now when the skill of teachers meets with the educational tools from YouDo – a conducive learning environment gets created where the subconscious mind of the child is engaged. If you are wondering how, here is the answer. In a classroom a teacher is talking about fractions. She is trying to tell the students that fraction means division. Now, in the same classroom the teacher uses fraction manipulatives. Instantly, the teacher has grabbed the attention of the class. The students can touch and feel the manipulatives which was not possible when fractions are taught on the blackboard or smart boards. That allows a student to figure out themselves how ⅓ is bigger than ¼ and four pieces of ¼ will be equivalent to one. The child will retain the concept because her subconscious mind has been engaged. The fractions have come to life. They are not numbers written on the blackboard rather the child realises that receiving one third share will be always more than getting one sixth. This where YouDo pitches in. The manipulatives designed by YouDo always keeps in mind the appropriate size and shape required to demonstrate a concept to a class of 35- 40 students. Our manipulatives help teachers engage the student through images and shapes. The touch and feel of these manipulatives translate abstract concepts to simpler and more concrete level. When a student works on them as the teacher explains it, it allows the child to unfold their maximum potential. Naturally, when students understand concepts they are not going to shun those subjects because it is difficult for them to solve problems. They are keen to take Maths and Science for higher studies because they have learned concepts clearly. The objective of YouDo is to partner with teachers and become an instrument in the full development of the child’s potential so that they starts to think out of the box and is able to discover new avenues for themselves.